**Monday’s edition of Rewind-A-Raw is available with Wai Ting and I reviewing the post-Rumble edition of Raw, a discussion on Ronda Rousey, the qualifying matches for the Elimination Chamber, the strange main event with John Cena and Finn Balor, Asuka vs. Sasha Banks, the return of Jonathan Coachman, your feedback and the announcement of this year’s winner of the POST Wrestling Royal Rumble Pool. You can download the show at https://www.postwrestling.com/2018/01/30/rewind-a-raw-1-29-18-asuka-vs-sasha-elimination-chamber-qualifiers/ and subscribe to POST Wrestling on any device. **Wai and I will be back tonight as we review SmackDown Live, we will go over the 205 Live General Manager reveal and we are also going to chat about the WWE 24 special from Sunday on WrestleMania 33. **Congratulations to Adam Neely, who was the winner of the POST Wrestling Royal Rumble Pool. Adam got 84 points from his picks out of a possible total of 134. The second-place finisher was Fraser Burtnick with 79 points and third place was Burney with 75 points. We had a total of 1,184 entrants into the pool and want to thank all of those that participated. From the total entrants, 696 chose Shinsuke Nakamura to win the men’s Royal Rumble and 758 picked Asuka for the women’s Rumble. **We also have a POST Production “Behind-the-scenes” video from Sunday’s Royal Rumble post-show with Wai Ting, Jason Agnew, and myself. This video is available for all “Double Double” café members and above. **It was reported by Mike Johnson at PWinsider.com on Tuesday that Jeremy Borash has signed with World Wrestling Entertainment. The signing is a stunning one given Borash’s numerous roles within Impact Wrestling that date back to the formation of the company in 2002. 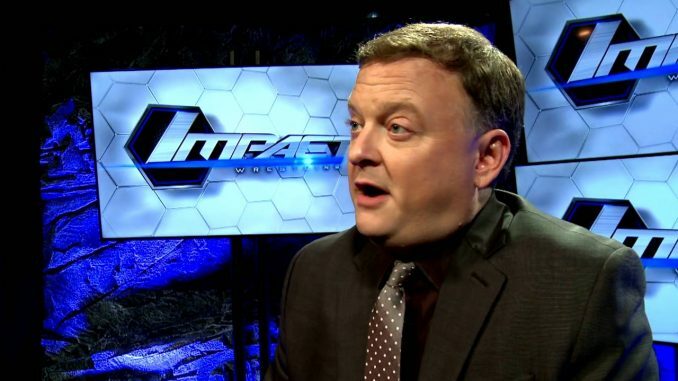 When it comes to the silent MVP of the company, Borash is it. He had the ability to be put in just about any role in front of the camera or behind-the-scenes and pull it off effectively. He was talented as a play-by-play announcer, he could fill in and did color commentary (a very different task than play-by-play), he was the in-ring announcer to set the tone for a major championship match, was the master of ceremonies at live events, he had great improvisational skill with backstage interviews where he could lead the interviews and react accordingly to the tone of the interview, he could do comedy, and he could host a wide range of segments from the “Feast or Fired” reveals to “The Spin Cycle” and entire shows. Behind-the-scenes he had a hand in the creative process, editing, establishing a footprint on the social media front a decade ago, spearheading the promotion’s U.K. presence by tailoring content specifically for that market, he launched “British Boot Camp” that he hosted, shot, and edited, he had a big hand in the creative for the Broken Universe in 2016 and had been serving as the voice of Impact Wrestling alongside Josh Mathews. Borash was the glue of Impact Wrestling since its launch and this is a loss that cannot be downplayed. **The WWE’s fourth consecutive night at the Wells Fargo Center in Philadelphia will feature the taping of SmackDown Live, 205 Live, and the Mixed Match Challenge tonight. They have announced a four-way match tonight with Jinder Mahal vs. Kofi Kingston vs. Rusev vs. Zack Ryder in a #1 contender’s match for the Bobby Roode’s U.S. title. 205 Live will feature the announcement of the new General Manager and probably some sort of announcement regarding the vacant Cruiserweight title. The Mixed Match Challenge will feature Braun Strowman and Alexa Bliss vs. Sami Zayn and Becky Lynch at 10 pm Eastern on Facebook Watch. **The WWE will be introducing a new concept for SmackDown Live with a top ten ranking. In the storyline, the performers will be the ones voting and it will be based on who is the most talented, has the most athletic skill, and locker room leadership. This is designed as a match-making device for television angles with the rankings acknowledged by Shane McMahon and Daniel Bryan, who cannot vote. Rankings have been used in the past and usually have not translated well. The most recent that comes to mind was when TNA attempted a ranking system, based off legitimate fan votes and it did not achieve what they wanted as fans just voted over-and-over for guys not being pushed, such as Desmond Wolfe / Nigel McGuinness and the concept was eventually dropped. **The Elimination Chamber event on Sunday, February 25th in Las Vegas will feature a men’s and women’s Elimination Chamber Match. The men’s match will feature John Cena, Braun Strowman, and Elias with three more entrants to be determined. The women’s match will feature Alexa Bliss defending the Raw women’s title against five other women. **E! has announced that the third season of Total Bellas will be premiering this spring. The season finale of the current season of Total Divas airs this Wednesday night. This is only a snapshot of one sector as the Rousey story was covered infinitely more among mainstream outlets. **NXT is taping television this Thursday and Friday night at Center Stage in Atlanta, Georgia. **Coming off his Royal Rumble appearance, Rey Mysterio is scheduled for Five Star Wrestling this Thursday in Liverpool, England at the Echo Arena. Mysterio is scheduled to face Zack Gibson and they are also advertising Rob Van Dam vs. John Morrison. The show is Liverpool will be a television taping for Five Star’s new deal with FreeSports, which will air Thursday nights. **Game Changer Wrestling will be presenting “Joey Janela’s Spring Break 2” over WrestleMania weekend and have announced a unique main event with Janela taking on The Great Sasuke. Last year’s “Spring Break” card was a big success that was able to find an audience during the most competitive weekend of the year with so many shows going on in Orlando and the surrounding area. This year’s Spring Break card will take place Fri, ay April 6th at 11:55 pm at The Pontchartrain Convention Center. **Gama Singh is going to be managing a stable of Indian wrestlers in Impact Wrestling that will go by the name, “Desi Hit Squad”. The group will consist of Rohit Raju (formerly Hakim Zane, who was all over the last set of tapings and came out of the Global Forced series), Vikas Kumar, Bhupinder Singh, and Gursinder Singh. **MLW has announced that ACH has been added to their “Road to the World Championship” card on Thursday, February 8th at the Gilt Nightclub in Orlando, Florida. The show will feature opening round matches for the MLW title tournament with: Jeff Cobb vs. Matt Riddle, MVP vs. Tom Lawlor, Shane Strickland vs. Brodie King, and Maxwell Jacob Freidman vs. Jimmy Havoc. **EVOLVE has announced that Travis Banks will be working for the promotion on Friday, April 6th in New Orleans, Louisiana at EVOLVE 103. The show will take place at 4 pm and will also feature Matt Riddle vs. Daisuke Sekimoto and WALTER vs. Darby Allin. **Tickets for the UFC’s return to London, England in March will be going on-sale on Wednesday. Former middleweight champion Michael Bisping had been rumored for this card but he issued a statement on Tuesday telling fans not to purchase tickets to see him as he will not be on the card and has spoken to the UFC about this. Bisping suffered a pair of losses last November. He was submitted by Georges St-Pierre at UFC 217 on November 4th and then returned way too quickly on November 25th in Shanghai as a late replacement for Anderson Silva to fight Kelvin Gastelum. Bisping was knocked out in the opening round by Gastelum. The UFC’s Fight Night event in London is scheduled for the O2 Arena on Saturday, March 17th. **The UFC has a Fight Night card in Belem, Brazil this Saturday night and will be broadcast on FS1. The card will feature a main event between Lyoto Machida and Eryk Anders. The other notable fights include bantamweights John Dodson and Pedro Munhoz facing each other and Valentina Shevchenko will be fighting at new flyweight division against Priscilla Cachoeira. **UFC heavyweight James Mulheron has been issued a one-year suspension by USADA following an out-of-competition drug test failure last November. Mulheron tested positive for clomiphene and hydroxyclomiphene and was pulled from his upcoming fight that month against Cyril Asker. Mulheron’s suspension is retroactive and he will able to return on November 17th, 2018. **Filming for the next season of the “Ultimate Fighter” will begin later this week with coaches Stipe Miocic and Daniel Cormier. Miocic will be working with Marc Montoya of Factory X Muay Thai as part of his coaching staff, while Cormier will be using members of his team from AKA as both revealed on The MMA Hour during their respective appearances this past Monday. The upcoming season will feature undefeated prospects and will premiere this spring. **The Professional Fighters League (the former World Series of Fighting) have announced a distribution deal with the NBC Sports Group and Facebook for the promotion’s inaugural seasonal format. The season will launch on Thursday, June 7th and run through the end of August with regular Thursday night programming on NBCSN and NBCSports.com and the NBC Sports app. The show will also broadcast on Facebook outside of the U.S. with 30-minute pre and post shows. The season will lead to a single-elimination playoff in October with the finals of six separate weight classes pencilled in for New Year’s Eve with the winner of each weight class receiving $1,000,000. **The PFL announced in the same release that they have hired former Under Armour and NFL executive Peter Murray as the promotion’s chief executive officer. **UFC middleweight champion Robert Whittaker has posted a photo online that shows him returning to training. This follows his withdrawal from the main event of UFC 221 next month in Perth, Australia due to a serious case of staph infection in his stomach. UFC president Dana White provided a grim update earlier this month regarding Whittaker’s issues. As a result, Luke Rochold and Yoel Romero will be headlining the UFC 221 pay-per-view for the interim middleweight title.